The Marathon des Sables –The Inside Track! 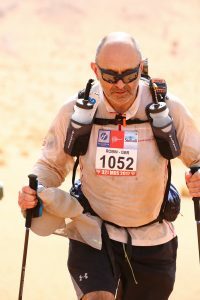 My Personal Training Superstar client Robin looks back on an unforgettable experience running the Marathon des Sables. Last month Robin was successful in completing the world famous Marathon des Sables. Also known as the Toughest Footrace on Earth! A gruelling 6-day race across the Sahara Desert in temperatures of up to 50° Centigrade. Sand is everywhere, stinging your eyes and chafing your skin. You carry all your own food and equipment and sleep in a communal tent. Water is rationed. Sharing a tent with 5 people I didn’t know (Tent 118) turned out to be one of the Marathon’s best experiences. The six of us developed a fantastic camaraderie and support network. One runner from our tent sadly didn’t manage to finish the race even though one of the other guys almost sacrificed his own race trying to help him make it through. I had spent a lot of time carefully planning what I would take with me, but I ditched a lot of it after the first day! Less stuff next time! My trail shoes disintegrated after 3 days! Fortunately, I managed to get them stuck back together again. I was a little disappointed that I didn’t run as much as I thought I would. You have to adapt to the conditions and accept that your pace will be slower than you expect. Day 3 was amazing! Running up four mountains where I felt at my strongest, and catching some awe-inspiring views. And the finish – celebrating with one small can of beer with other finishers from 52 countries under a desert night sky. Impossible to describe the feeling. Well I’d like to do it again! This time with a lighter pack, and to run more of it. So I can improve on my position of 756th! I can’t thank enough all those people who supported me. I was amazed how many emails and messages of encouragement I received. They really kept me going when things were tough. And the race support crew were great. They all wanted us to succeed. Be prepared – the desert will soon find you out if you don’t have the right kit. Get used to the hardship and deprivation! Do a mountain marathon or similar beforehand to gear yourself up mentally. Be true to yourself. Accept that it’s an adventure and go with it. Ignore the expectations of others and run your own race. In 2 years time Robin plans to do it all again. I’ll keep you posted! If you want to run an extreme event like Robin, or train for a ‘normal” marathon then get in touch. I’ve helped many clients like Robin achieve their fitness goals! And I’d love to help you to do the same! My next post will be about Superstar client Amy, female under 18’s winner of the Mel’s Milers 10k race around Christ’s Hospital.